Linking up with Kelly because she's the best. 1 - This song is on repeat at my house. Travis is not amused, but also can relate. Except I always went to Perkins with my friends - no Waffle House in Central Illinois. 2 - Thank you to everyone who came by last week and joined the link-up. It was so great having you here! I'm way behind on visiting all the blogs who linked up, but I will visit! Promise. And thank you, too, for all the congratulations on the new baby. We really appreciate your prayers and your joy in our growing family. 3 - The good news is that my morning sickness has really backed off a bunch. I still have some crazy food aversions that suddenly jump start morning sickness-like feelings but that just makes me think I'm having a girl. 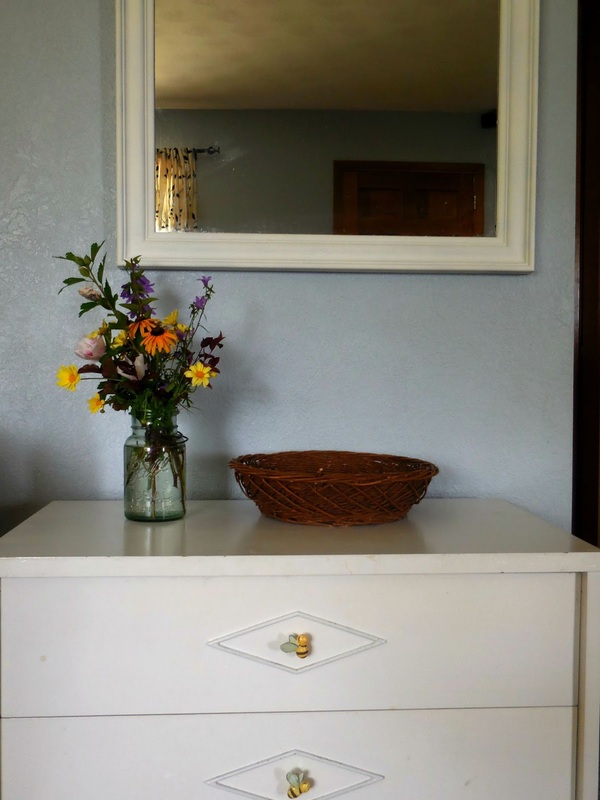 Took Teresa's dresser, moved her clothes to a cubby system that fits perfectly in her closet, and placed it under the mirror in the living room. It's supposed to have an entryway feel, which sorta works. The top drawer currently holds swimming suits, towels, sunblock, goggles, beach towels, and swim diapers. In the winter these contents will be switched with the contents of the bottom drawer: gloves, hats, mittens, scarves, and the like. 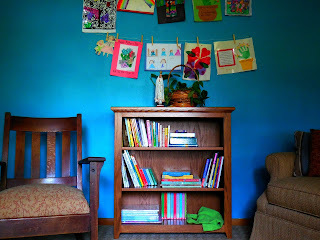 The middle draw is where the diapers and wet wipes are kept because I no longer use a changing table - just the floor. The kids tend to wear the same pajamas and clothes until they're too dirty to be worn again. During the night the clothes are stored with the diapers, during the day the pj's are here. The living room is so much tidier because of this system! From this angel it looks really full.... because it is really full. I promise things are shoved up against each other, and probably if I moved that rocking horse out it would be better, but the kids like to sit on it while they watch tv so it will stay. I do like having the end table - super handy. 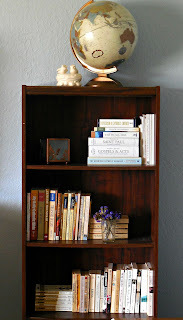 The bookshelf was given a little sprucing up, and some more breathing room. I like it better this way - with empty space. 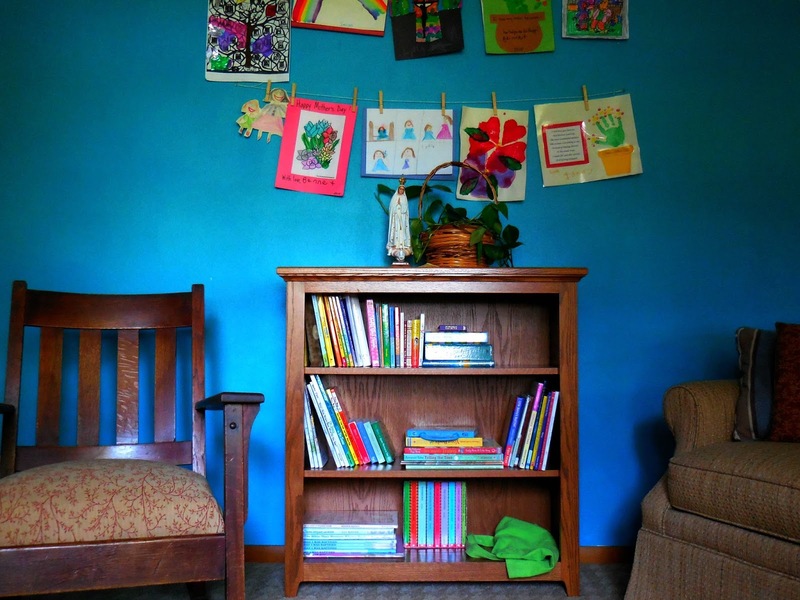 Many of the children's books that were in the living room were moved to the family room. My mom gifted me this oak bookcase, which I love and is really handsome. So far so good! That last link is to Kelly's blog This Ain't the Lyceum and it also includes a link-up for all the other posts. I wish everyone who wanted could have been there (I wish I could have been there!) but for various reasons it just wasn't meant to be, but I'm so happy for the women who were able to get away - who were able to dance and pray and chat and laugh and eat food they didn't prepare or have to clean up. I know Edel fills a need and I'm so grateful to God that Jen and Hallie are willing to put in all the hard work to make it happen. 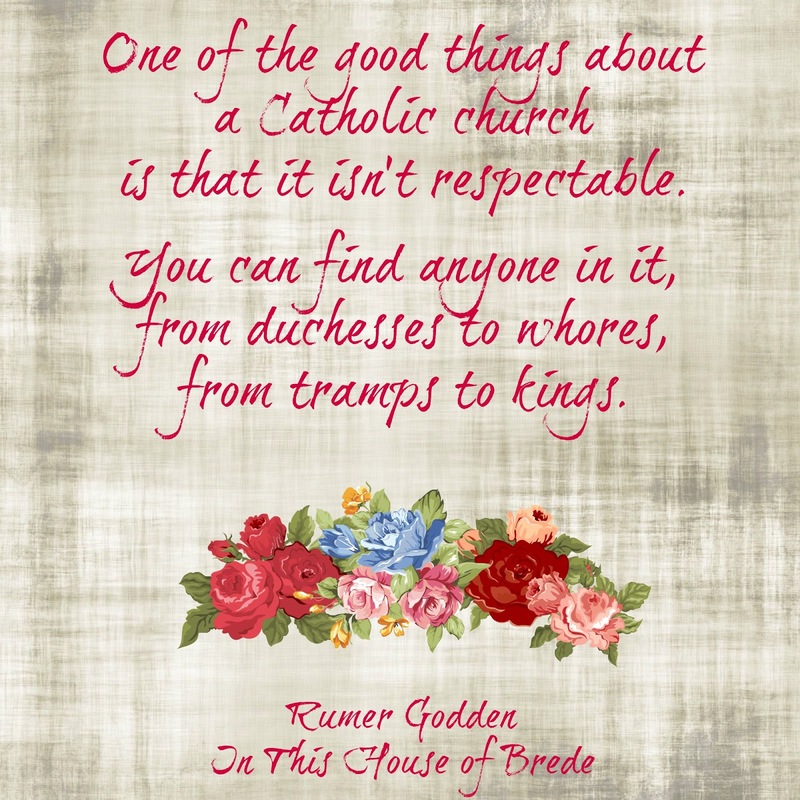 6 - I picked up In This House of Brede by Rumer Godden and though I'm only 30 pages in I am really enjoying it. My friend Nancy gave me a copy, so shout out to Nancy for being so wonderful and generous! 7 - For those of us who need simpler, less expensive events, much closer to home I am so happy that Jenna, the founder and Fiat-ess of Blessed Is She has started organizing BIS Brunches. Hopefully you're already reading and finding encouragement in the daily devotionals, but did you know there are also regional Facebook groups? In them we chat, share prayer requests, discuss the devotions, and have started planning the brunches. Right now there are brunches planned in Arizona, Illinois, Iowa, and Indiana but more are in the works. A Blessed Is She Brunch is such a great way to form community with our fellow Catholic women, and to do it in a way that is centered on Christ. aw, congrats, Bonnie! I must have missed the announcement. I hope you continue to feel better! I think I missed the news first time around on the new baby! Congratulations!! Rumer Godden is one of my favorite authors! Enjoy the book, it's fabulous! I missed the announcement too! Congratulations! Your house looks so beautiful!! And can't wait for the blessed brunches! I am so excited to host a brunch. And super nervous! But it will be really wonderful, I think. I'm excited to expand my local Catholic community. Okay, your #4 is brilliant! 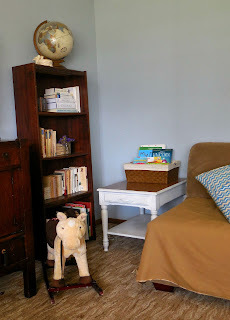 I've loved having our changing table but I kind of think it's falling apart and it might be time to get rid of it... A dresser would be a MUCH better place to shove all the diapers so the twins stop throwing them all over the floor!